Synthetic peptide corresponding to Human GRB2 aa 206-217 (C terminal). 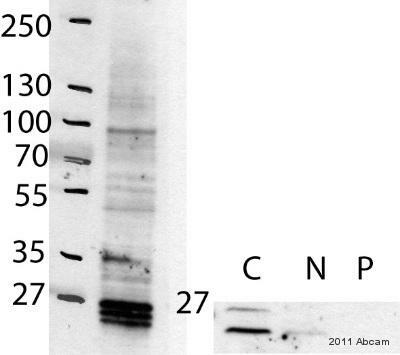 Recombinant Human GRB2 protein (ab85917) can be used as a positive control in WB. 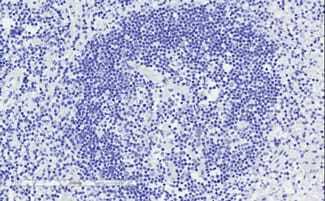 WB: MOLT4 cell lysate, mouse, rat, human and pig spleen, mouse and rat brain, and human thymus tissue lysates. IHC-P: Human lymph node tissue. Principal Names - GRB2; growth factor receptor-bound protein 2 Official Gene Symbol - GRB2. GenBank Accession Number – NP_002077. LocusLink ID - 2885. Gene Ontology terms - cell-cell signalling; SH3/SH2 adaptor protein; EGF receptor signalling pathway; RAS protein signal transduction; cell shape and cell size control. Our Abpromise guarantee covers the use of ab2234 in the following tested applications. In paraffin embedded Human Tonsil, stains mantle zone and to a lessser extent germinal centre. WB Use a concentration of 0.05 - 0.15 µg/ml. 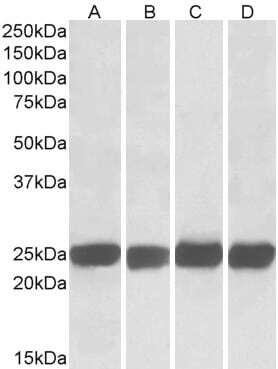 Predicted molecular weight: 30 kDa.Can be blocked with Human GRB2 peptide (ab22873). ab2234 (1µg/ml) staining of paraffin embedded Human Lymph Node tissue. Microwaved antigen retrieval with citrate buffer pH 6, HRP-staining. 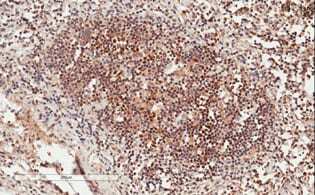 ab2234 negative control showing staining of paraffin embedded Human Lymph Node tissue, with no primary antibody. Observed band size: 26 kDa why is the actual band size different from the predicted? ab2234 has not yet been referenced specifically in any publications. Publishing research using ab2234? Please let us know so that we can cite the reference in this datasheet.